First of all the newspaper will help you not to get any stain over the floor either the wall or the place you will do this DIY so stick it with the masking tape over the surface you are going to work over. Later clean the pinecone with a toothbrush it will help you to take off all the dust. Once the pinecone is clean, apply the spray gently covering every part to make it look shiny like gold and when you have finished let it dry. For the final result add the candles in any position you want them to adorn your room. 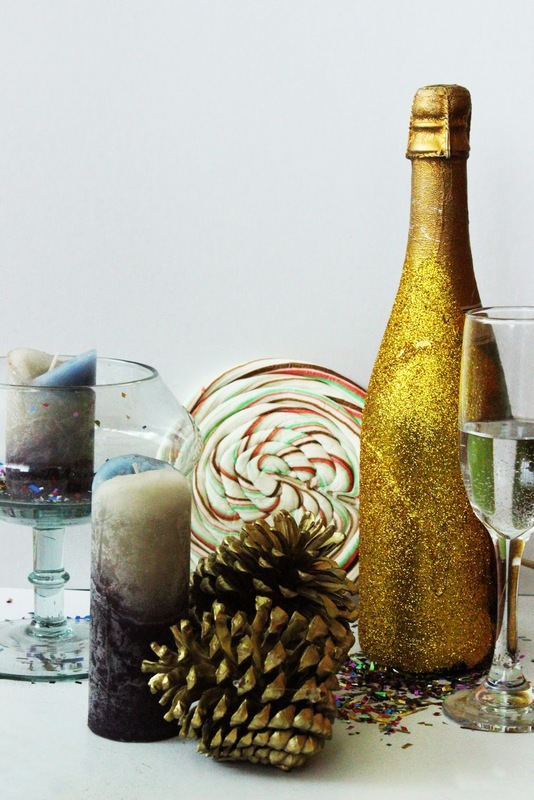 If you want to give your place more color the simplest way is to pour a little bit of colorful confetti inside any glass object, you will see how minimal and great makes your room look. Once you did it you can put a candle inside the glass object to make it more functional and just before midnight light it up to make 2014 an eternal but unforgettable year..
Last but not least this is also an easy one, just pour glue all over the surface you want to add glitter. Then cover it with your fingers, you will need to have your hands dried to apply the glitter other ways you will stick your fingers with the glitter and the result will be awful. Le it dry indoors, for a better result. And there you have three different options to make your 2015 a special year. Happy New Year, See you next Year with big new things. If you liked this and want to see more click down below and start following this passion.